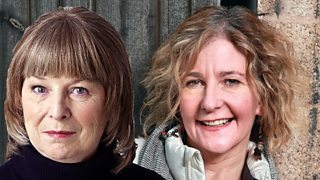 BBC Radio 4 - The Archers - What’s so great about fermented foods? What’s so great about fermented foods? Beware! If you asked Tom Archer this question you’ll need a good few hours to spare! Despite his recent set back with his kefir being taken of the Bridge Farm shelves he's still keen to pursue the fermented foods route, now with kimchi. He's convinced that fermented foods are good for you and he is still hoping to build a business on them. With the help of a Nuffield Scholarship, Tom has been exploring how it's done in other parts of the world. But before he hits the fermentation big time, he may have one stumbling block – the taste. As Clarrie and Susan demonstrated when he convinced them to taste kefir for the first time. One place where Tom could pick up some tips about producing kefir is Chuckling Goat run by Shann and Rich Jones. Based in Ceredigion in Wales, the couple started making kefir from goats milk in 2014. Since then their business has grown by 1000% and they have expanded from one goat to a herd of 70. “No one knew what it was when we started. Only people who were really interested in health and well-being took it up. The taste put a lot of people off”, she says. When it comes to convincing people about the taste of kefir, Shann explains that people need to realise that it’s not a milkshake, it’s a medical food. She adds it’s not a taste people are familiar with because “we put sugar in everything now; we don’t do bitter anymore, we don’t do tart anymore”. That said, Shann has found some people who like the taste, and have come to crave it over time. Shann’s business grew from seeing the benefits kefir had on her own family. After being in hospital for ulcerative colitis, Shann’s husband, Rich, returned home with MRSA. Shann says by using kefir she helped Rich return to full health. She has also used soaps and lotions which contain kefir to reduce her son’s eczema. Shann, who is originally from California, says the UK is behind a lot of other countries when it comes to knowing about kefir. For example, she says in Eastern Europe, where it originated, the production of kefir is a big industry and there is much more awareness about its benefits. [Kefir grains] are living organisms... They need looking after like farm animals. “Tom is on the cutting edge with his fermented food plans”, says Shann, “working with kefir grains (the organisms needed for milk fermentation) is like working with animals on a farm. They are living organisms, they behave differently under different conditions. They need looking after like farm animals. So, Tom may be surprised to find he will be calling on his experience of raising pigs as he joins the UK's fermenting pioneers! Fermented foods are a fast-growing market and there is potential for Tom to really make his mark. But first, he needs to get Clarrie and Susan on board. Which fermented foods are best for gut health?